If you’re a sauna lover, this sauna is for you! November 16, 2018 – About a year and a half ago, I had a bit of an “ah ha!” moment regarding Finnleo Saunas, the sauna brand we’ve offered for the past 10 years. I thoroughly enjoy my infrared sauna. And, I do love what Finnleo Saunas offers to our customers. The array of options they have for folks who are interested in traditional, custom design, outdoor, infrared, and InfraSaunas (exclusively theirs!) is unmatched by any other sauna company in the U.S. And, with their parent company hailing from Finland with nearly 100 years in the sauna business, their heaters and knowledge are hard to beat. But sometimes that array and the plethora of options can just be overwhelming! So many Finnleo Sauna dealers are also Hot Spring Spas dealers. Those of us with a long history of selling Hot Spring enjoy the fact that the tubs just need a level foundation and electrical ready in order to be set up and ready for soaking. This brings us back to my “ah ha!” moment. I thought to myself: What if you could purchase a stunning sauna that already had its own floor, had a cord-connected heater ready to plug in, and had many of the luxe features and a legendary heater Finnleo is known for? Basically, a sauna we could install, and you could plug in and be enjoying the very same night? 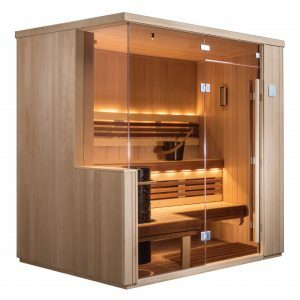 After a bit of back and forth and some input from Olympic, Finnleo introduced the Vita Sauna. It’s a beautiful portable sauna with a roughly 5’ square footprint that can be set up by our team and provide you the luxury of a toasty sauna session every day. If you happen to live in our area in Puget Sound, we’ve got this lovely new sauna on display in five of our six showrooms—Seattle, Fife, Issaquah, Lacey, and our newest showroom in Woodinville. We were lucky enough to be the first in the country to show this new sauna before it’s released to the rest of the U.S. in January. If you’re a sauna enthusiast and have always wanted a sauna that would be easy to install, this could be your sauna nirvana!